On Diamond Head Road at Diamond Head Beach Park on Friday, Duane Ching said "It's a bad thing to take it (parking) away just for bikes." He parked his car to go surfing. 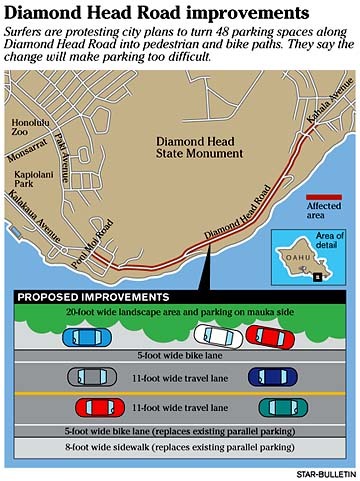 City plans to turn 48 parallel parking spaces on the makai side along Diamond Head Road into bicycling and walking paths are running into resistance from the surfers. Some surfers are circulating petitions against the loss of parking, which they say took them by surprise. "The bikers have enough room," said Bert Fujitani of Kaimuki, as he stowed his board yesterday afternoon after surfing at Diamond Head. "I drive by here every day and it's fine the way it is. It would be a bad idea to take out this parking." City spokeswoman Carol Costa said in an e-mail response to the Star-Bulletin's questions that the conversion of parking into pedestrian and bike lanes is a vision team project and that "for a year or more the community has been involved in the master plan process, holding community meetings." But two vision team members, including the leader for the Diamond Head recreation area, said yesterday they support the surfers' request to have their concerns heard. Councilmember Duke Bainum, who represents the area, said he thought it was a bad idea to have the makai stalls removed. He said the parking was left in during initial discussions with the vision team and he was surprised to learn that they were being removed. "How good are your recreational paths if you don't have the parking for the people who use them," he asked. Current plans are to keep parking at the three lookouts on the makai side of the road and the parallel parking along the mauka side. "Surfers have a point," said Michelle Matson, who is a member of the Diamond Head Neighborhood Board, the vision team and the Diamond Head Citizens Advisory Committee. "Parking should remain the same. It's unobtrusive. Cars may block the view, but I don't think they're hazardous. I think it's reasonable." Matson said original plans were to have a pedestrian trail and a bike path on makai side only, because bikers climbing the hill would be going slower than auto traffic. But she said that between the visioning meetings and the city's project design, a second bike lane was added, and "the administration's design priorities took precedence." She points to plans to add tree wells on the makai side of the road and in the parking bays and reacts: "This is a historic site, on national and state registers of historic places, and should remain as it is. The next thing we'll have is flower baskets hanging from these decorative light poles. ... Diamond Head doesn't need to be redecorated. It's a natural scenic area." Rand Potts, vision team leader for the Diamond Head recreation area said he approved of the master plan that removed the parking, but now sees that "obviously we stepped on toes of surfers and the surfers are rising in rebellion." Potts said it's "too bad it got down to this," and he hopes a resolution can be worked out -- without resurrecting a formerly rejected idea of building a new parking lot on the makai side of the road. Rolf Verhulsdonk said the popularity of Diamond Head as a surf spot has increased in the 20 years he's been coming there and the parking is badly needed. He also rides a bike there and thinks current conditions are OK.
"To remove parking, I don't think that makes much sense," Verhulsdonk said. "Sometimes you can't even find one little parking stall at both ends." Many bicyclists and walkers on Diamond Head Road yesterday greeted the idea of separate lanes for biking and walking enthusiastically. Others, however, felt things are fine as they are now. Jason Tanaka, who was bike-riding on Diamond Head Road yesterday had a philosophical view of the conflict: "Either way you're going to make some people happy and some disappointed." Reporter Gordon Y.K. Pang contributed to this report.